As a kid growing up in the 1960's and 70's, I followed all the local pro teams. I was a Laker and Dodger fan. And, I was a fan of the Los Angeles Rams. The Rams of that era weren't much on offense, but they had possibly the best defensive line of all time. That line, with Lamar Lundy (#85), Rosey Grier (76), Merlin Olson (74) and Deacon Jones (75), was known as the Fearsome Foursome. Individually, each of the Foursome were great football players. Together, as LA Times' writer Jim Murray put it, they could stop Hitler's tanks. But, the Foursome were more, much more, than football players. The Foursome were extraordinary -- on the field and off. Undoubtedly, they are one of the most impressive groups ever assembled on any sports team. 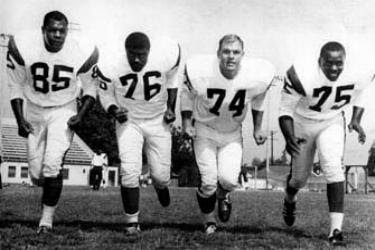 With the recent death of Deacon Jones, I want to spend a moment looking back at the Fearsome Foursome. Deacon Jones. 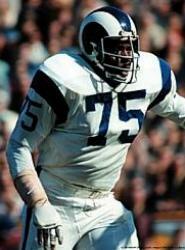 David Deacon Jones was the best Ram of all time and one of the best football players ever. In a 2010 survey of players, coaches and writers, Jones ranked as the 15th best NFL player of all time. He was named defensive end on the NFL's 75th anniversary team. Jones revolutionized defensive line play. At 6 foot 5 inches and 270 pounds, he was strong enough to manhandle offensive linemen and fast enough to chase down ball carriers. He was a bit of a character and gave himself the nickname "Deacon" because of its religious tone and to separate himself from other David Joneses. He is also credited with coining term "sack," which is quite descriptive if you envision a large guy slinging around the opposing quarterback. Deacon Jones brought more than just great athleticism. He exuded confidence and overcame repeated obstacles. After his freshman year in 1957, he was kicked out of South Carolina State for participating in a lunch counter demonstration. Undeterred, he enrolled in Mississippi Vocational College where he continued to play. In 1961, the Rams drafted him in one of the final rounds. Despite being a late round pick, he quickly distinguished himself and dominated the NFL. In 1965, super conservative Rams' coach, George Allen, named him the Rams' captain. After football, Jones went into show business. He sang with the likes of Ray Charles and was part of a band which was the precursor to the group WAR. Jones appeared in many movies and TV shows. He founded a nonprofit to help inner city youth and traveled overseas to encourage American soldiers. .And there's one more thing. That coach who named Jones the Rams captain back in '65, had a daughter named Jennifer Allen, who grew up watching the Rams and hearing her father talk about his players. She named one of her sons Deacon. That's a pretty good testament to character. Merlin Olsen. Olsen was agile and strong at 6 foot 5 and 270 pounds. On the field, he was one of the best ever. The 2010 survey that I mentioned above ranked Olsen the 27th best NFL player of all time. Along with Jones, Olsen was also named to the 75th anniversary all-NFL team. Olsen did not miss a game in his 15 year career. He was so fierce Jim Murray wrote that Olsen once went swimming in Loch Ness and the monster got out of the water. Off the field, he was no less successful. He went on to a television and movie career that included memorable roles in Little House on the Prairie and Father Murphy. Good stuff. Merlin Olsen died in 2010 at the age of 69. Roosevelt (Rosey) Grier. Named after FDR, at 6 foot 5 inches and 280 pounds, Grier was the oldest and biggest of the Foursome and is its only surviving member. Incredibly gifted, Grier distinguished himself in many fields. For starters, Grier was recognized as one of the best defensive tackles in football and was named to the All-Pro and Pro Bowl teams multiple times. But, as good as he was in football, he is better known for his off the field exploits. Most notable is Grier's heroism at the Ambassador Hotel the day presidential candidate Robert F.Kennedy was assassinated. After Kennedy was shot and while the shooter, Sirhan Sirhan, was still firing, Grier pinned Sirhan against a table and took away his gun. Grier served as a pall bearer at Kennedy's funeral and was a delegate to the 1968 Democratic Convention. Grier's off the field resume is incredible. He is a talented guitar player and singer who was writing and recording music while he was still playing football. He recorded for many top studios and played Carnegie Hall. In 1969-70, he hosted his own variety and talk show on KABC television. As an actor, he appeared in more than 70 television shows and movies. Grier traveled with Bob Hope to entertain American troops. He has written six books, including his autobiography, a book on needlepoint and a novel. He founded nonprofits to help inner city families and youth. He's an ordained minister and inspirational speaker. And, he's just one guy. What an amazing life. Lamar Lundy. Though the least renowned of the Fearsome Foursome, Lundy was a formidable and versatile athlete. In any other company, his individual prowess would have been more celebrated. At 6 foot 7 inches and 250 pounds, he was a college basketball and football star and was selected in both the professional basketball and football drafts. He chose football and played for the Rams for 13 years. He was named to the Pro Bowl in 1959 and was named All Pro in 1967, both signifying he was among the league's best at his position. The Rams also occasionally used Lundy as a receiver on offense. Off the field, Lundy was less visible than his running mates. His biggest film credit was a recurring role as a giant cyclops who threw boulders at the Robinson family in Lost In Space. Lundy died in 2006 at the age of 71. Of course, the once eminent Los Angeles Rams football franchise is no more. In 1980, the teams' disgraceful ownership moved the team to Anaheim. From there, in 1995, they moved the team to St. Louis. I will save the LA Rams' sad story for another day. For now, it has been fun to look back on the Fearsome Foursome, who dominated their sport and, in so many ways, were bigger than the sport itself.